Here’s where we say, we appreciate you, but it’s not just us that appreciate you — by sponsoring you make a difference in the lives of many people directly attending the tournament. But, let’s not stop there! 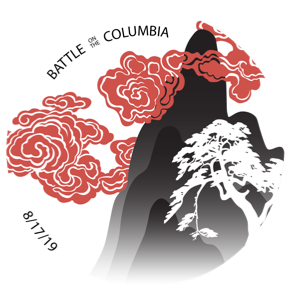 By helping Chon-Ji Martial Arts Academy host this tournament, three different entities including charitable and research institutions, will receive donations from Battle on the Columbia’s profits. We’d love for you to be a part of those gifts. Sometimes known as “event naming rights”, your logo will be prominently displayed on all marketing materials including: flyers, back of the tournament t-shirts, competitor sign-up sheets, a link on the Battle on the Columbia Facebook page, and all electronic correspondence. Your banner (max 10ft x 15ft) will be prominently displayed at the tournament venue. Your marketing team will be provided with a table at the event to speak with competitors and spectators. Your sponsorship will be repeatedly recognized throughout the tournament. This item is available on a first come, first served basis. There can be only 1! Sometimes known as “ring naming rights”, your logo will be displayed on various marketing materials including: flyers, back of the tournament t-shirts, on a ring standard, a link on the Battle on the Columbia Facebook page, and all electronic correspondence. Your banner (max 3ft x 5ft) will be displayed at the tournament venue. Your sponsorship will be recognized whenever a competition in your ring has been concluded. This item is available on a first come, first served basis. There are only 6 available. Choice of rings to be assigned will be at the sole discretion of the event staff. This item is available on a first come, first served basis. There are only 20 available. Thank you for your support. Your sponsorship will be greatly appreciated by the hundreds of participants and their families.